When it comes to audio, Klipsch has got to be one of the legends out there. With some of their products coming from as far back as the old school days of hi-fi, it seems as though Klipsch has been through it all. They’ve not only managed to survive massive industry changes, but they actually made the most of it, and even flourished along the way. Klipsch has proven to be highly adaptable, over and over again. They certainly deserve a lot of credit for their constant attempts to improve their products and adapt to the industry, as well as the market and various price points. One of their notable creations is the Klipsch RB-61 II – a piece of audio gear definitely worth taking a look at. It’s also important to note that Klipsch is the only brand represented twice on our best bookshelf speakers under $500 list (it could very easily have appeared 3 times!). So, stay tuned and keep reading our Klipsch RB 61 II review! The best thing about the Klipsch RB 61 II is its dynamics and overall sound “warmth”. In addition to music, the RB61 range means it’s great for movies and TV – just connect it to your home surround system. The RB 61 has a very stylish yet discreet design which is perfect for almost all aesthetical needs. No kids? Take the grill off and expose those lovely cones! It’s slightly larger (mainly taller) than other units which offer similar performance. If you don’t have enough space for your home theater, or on your shelf-height, you might end up having trouble placing it in the best position. The very first thing we need to mention is the amazing and pure quality sound that this speaker produces. 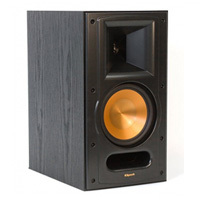 The Klipsch RB-61 II is excellent in this department. It delivers fully defined sound, balanced in a way that makes it a pleasure for your ears to enjoy each tune. The Klipsch RB-61 II uses a tractrix horn in order to boost the tweeter, which gives the highs a real edge. Another thing worth mentioning is the impressive sound clarity. You’ll notice that once you start to move into the mids the tone gets wider, but with no bumps in sight. We must also say that vocals sound astonishing with speaker! One of the biggest worries of potential bookshelf speaker buyers is the low-end response. However, the Klipsch RB-61 II has that covered. Using a 6.5″ woofer, the bass does its thing in a perfect manner. It makes low-end response defined, fulfilling and thick. The RB-61 II has simple, yet stylish design. The cabinets are firm and made of quality MDF, covered by black vinyl. The front face of this speaker is designed in a way that makes it look like it’s genuinely floating. There is a firing port on the front, right underneath the woofer cone. When building the Klipsch RB-61 II, the manufacturer stayed loyal to their classical black and bronze theme, which proved to be a hit with previous versions. This also makes this particular color combo adaptable to pretty much anything you may have in your interior. If there is one thing that stands out with the Klipsch RB-61 II, that’s the amazing combination of hardware. The woofer takes the form of a 6.5′ cone which is highly responsive. You’ll find the enhanced titanium tweeter sitting comfy in the tractrix horn. These two transducers, when combined, have the power of 100 Watts RMS. Another useful feature is the front firing port. Whereever you position your speakers, you won’t have to worry about the distance from the walls near it, thanks to this particular feature. 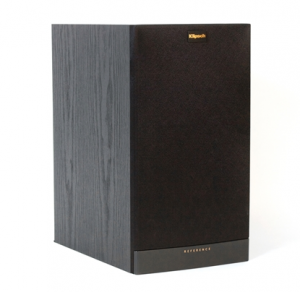 We have to end our Klipsch RB 61 II review by stating the obvious – you cannot go wrong by choosing it. Regardless of what your needs are or how large your room is. You can rely on the fact that this amazing speaker is up to the challenge. After all, Klipsch is one of the brands that you can certainly trust when it comes to audio gear. If there’s a brand worth investing in, Klipsch is the one. So, don’t waste your time or money on anything else, this speaker is an excellent choice, especially for a home theater combo. As it’s proven over time with the countless customer reviews, it offers tremendous sound, excellent performance and durability, and most importantly, impeccable sound. Why not check out the Klipsch RB 61 II on Amazon and see the reviews from other buyers?